After the massive national demonstration of today in Athens, we – the Student Unions and the Occupied Universities – declare that we will continue our struggle. In this struggle, neither the silence of the government and the ministry of education towards our demands nor the brutal attack of the police against our demonstration will intimidate us. The unprovoked assaults of the police against our demonstration, the dozens of wounded students and the unjustified arrests of demonstrators will fail to terrorize us. The junta of the socialist PASOK showed once more the way they have chosen to deal with the youth and the working people that are fighting for their rights. For us, the true dialogue on education takes place in the university halls and in the streets and not in the closed chambers of the parliament. The thousands of students that participated in this true dialogue have declared their opposition to the new educational reform. This is refuted by the academic community as a whole and by the struggling parts of the youth. In the last period, the working people and the youth felt an unprecedented attack against every aspect of their lives. The agreement on the payment-extension of the state debt condemns the country to a long period of high unemployment, poverty and brutal exploitation. Now, we can understand very well what the government and the Troika (EU-ECB-IMF) meant when they said that until now we were "in the honey-moon of the memorandum". The modern junta of government-EU-IMF does not hesitate to call and apply a 'civil mobilization' of the dock workers that were on strike and to apply the most brutal repression against any part of the society that is fighting for its rights. In this situation, we believe that the movement of the youth can spark the anger of the people and generate a massive victorious movement that will overthrow the status quo of social injustice that they are trying to establish. This is the fifth week that the student movement has been active with assemblies and occupations in universities. We are in the streets just as our colleagues in the UK, in France and in Italy. In the whole Europe, students are mobilizing against the Bologna-model, the introduction or increase of fees and the subjugation of universities to the interests of the free market. We express our wholehearted solidarity to their struggle. With the national student demonstration of today, we declare that the struggle against the educational reform of minister Diamantopoulou, the abolishment of the rights of the working people and the 'memorandum' of the PASOK-government, the EU and the IMF will continue. The PASOK-government - being fully aligned to the directions of the Troika (EU-ECB-IMF) - published the budget of 2011 that actually is a budget of social genocide. This budget signaled the coming of the second 'memorandum'. The 2011 budget destroys the last remains of the welfare state and condemns the largest part of the population to poverty through price- and VAT-increases and a new financial 'gift' of 320 million euros to the capital. In 2011, the government will cut the budget in education, health care and culture, while it will reduce further the salaries, will abolish restrictions in layoffs and will privatize public enterprises. Despite these painful (for the working people) cuts, the state debt will continue to rise. This will lead to an agreement for the restructuring of the debt that will in turn bring new budget cuts. In the front of education, minister Diamantopoulou is preparing to bring to the parliament a new law on the educational reform after conducting a fake dialogue with her own party, PASOK, the conservatives, ND and the ultra-right party, LAOS. This educational reform is using all the well-known excuses for the need of 'development' and 'exit from the crisis' to apply all the unpopular measures that we have seen the last years and to apply the also-unpopular 'memorandum'-policies in education. The aims of the reform are to force universities to operate under the free-market principles, to abolish university degrees in their current form, to abolish the rights associated to these degrees and to subjugate research to the needs of the free market. At the same time, this educational reform will reduce the number of students in public universities, will introduce fees and will privatize student houses and university restaurants. Moreover, this reforms aims at intensifying the tempo of studying through the imposition of compulsory presence at the lectures, the introduction of 'courses in chains' (you have to pass course 1 in order to start attending course 2) and the abolishment of extra exam periods. This reforms aims also at increasing repression on students through cancelling any potential of the student unions to fight for the rights of students. The university 'asylum' (this means that the police is not allowed to enter the university without permission unless a serious crime is being committed) will also be a victim of this reform. Most of these measures are incorporated in the National Framework of Skills that diversifies education in 8 levels and qualifies the candidate according to knowledge, abilities and skills. This happens in public universities where their temporary personnel will be laid off and education is deteriorated. Their way of overcoming the crisis is to build a 'new' university that will serve fully the interests of the free market. The gloomy future of precarious employment adds up to all this for the youth. The generation of '592 euros' (the new national minimum salary) is now established by law. This will be also the generation with no collective wage agreements, no protection against layoffs, the generation of child labour. This will be the reality for the people that will enter the labour market from now on. The future they prepare for us has nothing else but flexible employment, temporary work, sky-high unemployment and a large informal-black sector in the labour market. The worker of the near future will work longer hours and for more years, will be paid less and will be forced to acquire new skills while facing constantly the fear of unemployment. The future of young people will be used as collateral for a state debt that the people have paid already again and again. In this situation, the youth will flood again the streets on the 6th of December. We are a generation that is being shot every day by the modern junta of PASOK-EU-IMF. We identify ourselves with Alexis .With the conviction of the murderers of Alexis our demand for justice was fulfilled. However, this is not enough to close the case of the first youth revolt worldwide after the financial crisis of 2007. The true conviction of those having the political responsibility can only be achieved by the movement. The aims of the movement of December 2008 still remain unfulfilled. This is clear as a whole generation sees its rights to be abolished, repression to increase, people fighting for their rights to be unjustifiably prosecuted (even high-school students are prosecuted as terrorists and demonstrators covering their faces are considered by default perpetrators). This becomes also clear when seeing the media to libel the movement and cover up the acts of the government. The light of December 2008 will be on again. The youth will give the sparkle and will stand alongside the working people to overthrow the unpopular policies and to erase the state debt that condemns the majority of the people in order to save the banks and their exploitation system. At this very moment, we are called to give the battle of our generation. We are called to make our own history. The continuation of the actions and the occupations, the social and nation-wide extension of our struggle is the only way out. The student unions declare their active participation to the movement. They call to a common struggle with the whole society. Let the national demonstration of today to become the launch of new struggles. We will not allow the government, the EU or the IMF to destroy our present and our future. We will overthrow the policies of the 'memorandum' with a long-lasting struggle. In this struggle, we will stand side by side with the working people, the high-school students and the rest of the youth. 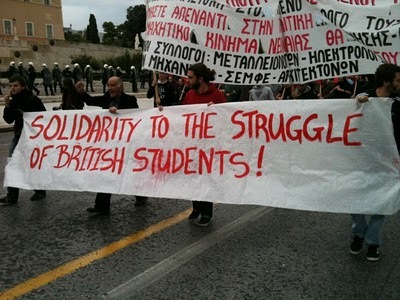 Students and workers will stand together in the nation-wide strike on the 15/12 to overthrow the junta of PASOK-EU-IMF. We will continue with assemblies, massive protests, occupations. We will continue by coordinating all these actions with each other and with the strikes organized by the workers. We will continue till the final victory! • Withdrawal of the discussion-document of minister Diamantopoulou. Withdrawal of the unpopular educational reform. • No participation in the fake dialogue with the government. • Overthrown of the 'memorandum', the stability pact and all the associated policy measures. Down to the junta of government-EU-IMF! • Immediate disengagement of the country from the 'support'-mechanism of EU-ECB-IMF. The working people will not pay for the crisis. • Disobedience to the EU and its directions. Let Greece become the broken link of the Bologna process. • Block the Budget of layoffs and budget cuts. • Block the plan for the reform of employment relations. Full working and pension rights for the youth. Permanent jobs for everybody. Generous increases in salaries and pensions. Unemployment benefit equal to the minimum wage. • Unified public and free education for everybody without class or financial barriers or exams! • Overrule all unpopular education laws. • Free books, housing, public transport and university restaurants for all students. • One degree per knowledge-sector. All working rights to be associated to this degree which should be the only requirement for employment. • No restriction or abolishment of the university 'asylum'. Establishment of asylum in schools and workplaces. • We declare our solidarity to the high-school students in Iraklio and elsewhere. All charges against students in Larissa 9/12 should be dropped. • Disarm the police, abolish the riot police. Defend the right in demonstrating, occupying and striking. Abolish the anti-terrorist law! • All charges against our fellow students should be dropped. Our struggle will not become illegal! • To a new round of assemblies and occupations at all universities. • To massive demonstrations on Monday, 6/12 in all cities. • Several actions inside the universities and in the street to widen our movement. Just before the nation-wide strike of the 15/12, we mobilize at the Unemployment Office on the 14/12 against policies leading to unemployment. • We mobilize at the meeting of University-deans on the 11/12. WE CONTINUE ON THE WAY OF DECEMBER 2008 AND THE SOCIAL STRUGGLES. WE CONTINUE AND ESCALATE OUR ACTIONS TILL THE FINAL VICTORY! WE WILL BECOME THE GENERATION OF OVERTHROWING!! At least 39 occupations of universities at the moment in Greece. what is the top rated forex trading software robot on the market along with does it work.i heard which a new automatic robot has just been released (rctpa powered forex software megadroid). there are really many software on the market. just what is a forex trading software software anyway what one is doing work i have heard many good things about forex software automobile pilot turbocompresseur. i would like to know which one is regarded as the reliable. thanks.if you are looking for that industry leading forex, visit this kind of sitethe-industry leading-forex-software-in-internet.blogspotthis software is a leading application that can help raise your trading earnings and user friendly.industry leading wishes.the industry top way to funds from forex trading is registering with newfxlife40 to 70 pips daily funds refund in the case of loss record abuse.i would like to share zero loss forex trading secret go to bit.lyno_loss_forex document abuse.i want to share no loss forex secret visit bit.lyno_loss_forex record abuse.yes my dear good friend ,under much recession the forex market cannot predictable that currency frames are state of the art to buy and then sell on.lot of robots are there forex trading megadroid, fap turbo at the,t,h. they both palys essential profits. though the fault is that they could not measure the market situations data base.underneath these all instances latest july 28th ivybot premiered with incredible 4 currency exchange pair attacks and it can changes database automatically itself.i am quite ting earnings for very last 2 weeks. the truth is im computerized robot utes testing fool while testing this i acquired bit shocked about this efficiency. and much more extra.take a look on your own.i participate in a private group that investments with Nine different forex trading robots.the point that i find best is that distinct robots have different degrees of success in several market problems.fap turbo looks like it's pretty consistent. ivybot has us all pretty enthusiastic. fap evolution is worth keeping the eyes on if it becomes available yet again.spreading an investment across multiple robots provides proven to be a very good strategy.industry leading wishes for the success.robert.$26,391 in 90 days i am using ivybotivybot is not just the one robot that provides you limitless updates along with a separate automatic robot for each foreign currency pair, ivybot is hands down the most profitable forex automatic trading program ever produced! ivybot has been again tested, seo'ed, and forward tested to perform one thing, generate profits!.the ivy bot is looking fantastic at the moment. it had been developed by a lot of guys who were were studying at a very esteemed university. this process has Some robots, One for each foreign currency pair that it was designed to trade, consequently its means beyond the remaining other currency trading robots. i have been using this now for earlier times month & made a good bit of money with it.there are numerous really good software on the market right this moment, but i was not able to discover which one to attempt until i ran across this team website theforexmasters.infoit really simplified issues for me and helped me make an informed choice. good luck!.we are fap turbo individual. i didnt make use of megadroid because i am y pleased and satiesfied with fap turbo so i didnt use it.secrets in the heart features reduced chance expert advisers, custom programming and a top rated margin car loan calculator. check it out.